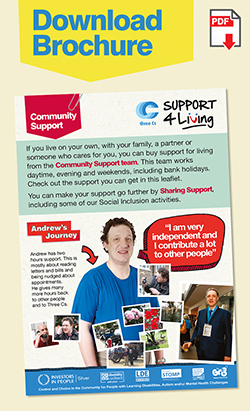 If you live on your own, with your family, a partner or someone who cares for you, you can buy support for living from the Community Support team. This team works daytime, evening and weekends, including bank holidays. Check out the support you can get below. You can make your support go further by Sharing Support, including some of our Social Inclusion activities. Tony likes speaking up as a Housing MP for the People’s Parliament in Lewisham and as a member of Three Cs Social Inclusion Task Force. Tony is fun-loving and likes to let his hair down too. He came up with the idea for a social contact group called Only Pub Grubbers. “I want to meet new people and help sort out getting people together” he says. Our Community Support team is highly experienced and has been in operation for over 20 years. Support staff have a reputation for being dedicated and very committed, often going the extra mile to make sure the people they support are safe and living life to the full. We currently provide Community Support to 60-70 individuals with learning disabilities, autism and/or mental health challenges in Newham, Greenwich, Lewisham and Southwark. A growing number of those we support present challenges to services and require support workers who are competent in behaviour support and experienced in a multi-agency approach. Some people use a mixture of one-to-one support in the home, shared support for social and leisure activities or group support through Three Cs social inclusion team. In this way, support can be stretched to go much further.